Srinagar, Feb 12 : Security forces burst teargas shells and resorted to lathi charge to disperse demonstrators who were trying to disrupt Cordon and Search Operation (CASO) during which a militant and a soldier were killed on Tuesday. Meanwhile, a police spokesman has appealed to people not to venture inside the encounter zone and requested people to cooperate with police till area is completely sanitized and cleared of all explosive material. As a precautionary measure mobile internet was suspended since Tuesday morning while trains remained off tracks in south Kashmir. Large number of people, mostly youths, hit the streets at Ratnipora and adjoining areas trying to disrupt the operation. However, security forces and state police personnel deployed in the area immediately swung into action and resorted to lathi charge to chase away them. 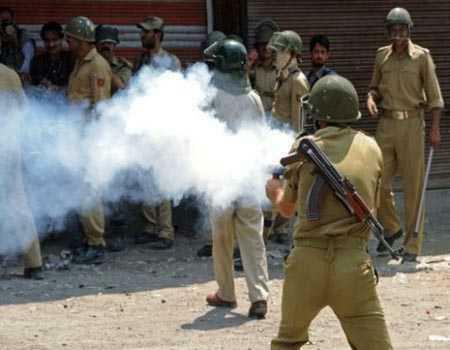 Security forces burst teargas shells after the stone pelting demonstrators refused to disperse. Clashes were going on when the reports last came in. Several persons were injured in these clashes. Meanwhile, shops and businesses remained closed and traffic off the roads in these areas.